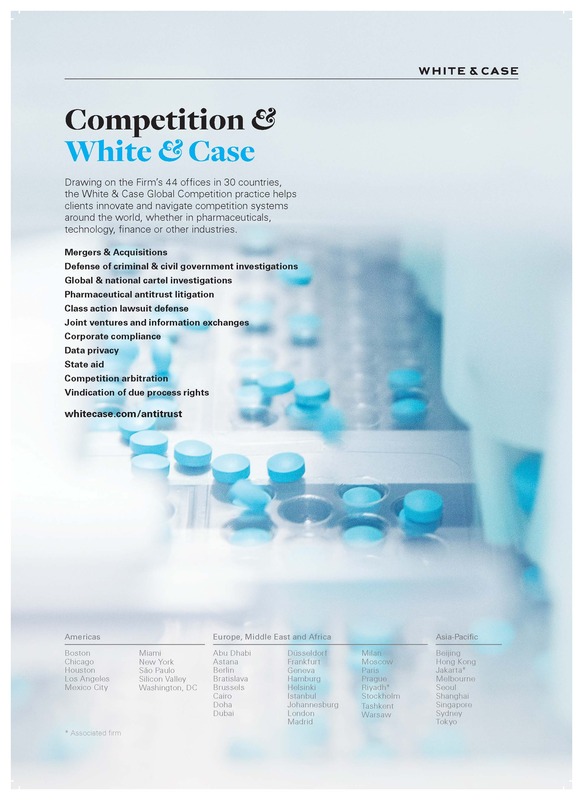 White & Case has long had well-regarded competition practices in the US and Brussels, but has looked to strengthen its European presence further. That continued in August 2017 with the hire of Veronica Pinotti from McDermott Will & Emery in Italy, and litigation specialist Hamish Macpherson from Herbert Smith Freehills in Australia in May 2018. Recent deal work at White & Case has been more modest than the blockbuster attempt at clearance for Anthem’s acquisition of rival insurer Cigna. The firm advised Vertex Pharmaceuticals on its acquisition of CTP 656 from Concert Pharmaceuticals in the US and PGE Polska on its acquisition of EDF in Poland, which were both subjected to in-depth reviews. It also secured unconditional clearance in Spain for a two-to-one merger between Pastificio Rana and Nestlé Italiana, which followed an in-depth review by the country’s enforcer. The firm has an impressive portfolio of cartel work and continues to defend several companies before the courts. It represents Crédit Agricole before the EU General Court in its appeal against the Euribor decision and Nexans in its appeal before the same court challenging the seizure of documents by the commission during a dawn raid that led to the Power Cables Cartel decision. In criminal defence work, the firm prides itself on ensuring that clients don’t plead guilty. The team defended Toshiba against a lawsuit brought by the Illinois attorney general, resolving claims it fixed the prices of LCD panels – ensuring it is the only LCD manufacturer not to be convicted of price-fixing or to have admitted guilt as part of an amnesty application in the US. The firm also defended the same company against a lawsuit brought by the Washington attorney general for the alleged price-fixing of cathode ray tubes. Other high-profile work included successfully defending former JP Morgan Chase trader Richard Usher at trial from the US Department of Justice’s charges of price-fixing and bid-rigging as part of a scheme to manipulate the foreign exchange market. The firm advises several pharmaceutical companies on behavioural matters across Europe and the US. It represented Servier in its appeal against the European Commission’s largest-ever pay-for-delay fine in the Perindopril case and led Pfizer’s fight against the UK antitrust watchdog’s phenytoin excessive pricing decision, which was annulled by the UK’s Competition Appeals Tribunal. It is also defending Allergan in several high-value private damages claims in the US, including one pay-for-delay case relating to its Botox cosmetic drug, which the firm settled for 1% of the potential damages. It also defends drug makers Pfizer and Boehringer Ingelheim against stateside private litigation claims.